A 13 year-old New Jersey girl, McKenna Pope, recently started a Change.org petition in order to appeal to Hasbro that their popular Easy Bake Oven toy should be more gender-neutral. Pope started the campaign because her little brother really wanted an Easy Bake Oven for Christmas, but not the purple colored oven that Hasbro currently makes, as it’s too girly. Pope’s heart was truly in the right place when she started this petition. I applaud any youngster who takes the time to actually take a stand for what they believe in, but the consumer pandemonium that has ensued due to this campaign is a bit wacky and ironically incredibly sexist, which obviously defeats the purpose of an anti-sexist campaign. So far, Pope has gained more than 44,700 signatures for her online petition, along with the support of celebrity chefs like Bobby Flay – all of whom back Pope’s plea for a gender-neutral Easy Bake Oven in colors suitable for a boy or a girl who doesn’t like, “Girl colors.” Hasbro has met with Pope, telling her that a more boy-friendly Easy Bake Oven has been in the works for months, and starting in 2013, they’ll be selling an Easy-Bake Oven for boys in black and silver. “I have been looking for an easy bake oven that is not so “girly” for my 9 year old son who loves to cook. I would get him the one offered, however his big brothers would have a field day with a pink and purple oven!” NOTE: This parent should have a LONG talk with that older brother. “I hated pink and didn’t like playing with Barbie when I was a kid” (from a female petition signer). Tons and tons of other comments mimic the ones above. Person after person has called out Hasbro for being sexist while simultaneously calling pink and/or purple a “girl color” or have noted that they’d for sure buy this for their son, but not in such a “girly color.” Wow. Just wow. Irony at its best. So, let me see if I have this situation straight. Hasbro is sexist – but people who think purple is a “girl color” are in no way sexist. Pink is a girl color. Purple is a girl color. Colors like pink and purple limit girls abilities. Blue, green, beige, white, black, red and yellow are “neutral colors” that every child on the planet likes. Boys can cook too – but they totally cannot cook with a purple oven because that is girly and/or “gay” (yes, a lot of people called purple “gay” in their comments. Feminist little girls (i.e. smarter, stronger and better than other girls) do not want pink or purple toys. They want “boy colored” toys. Girls who want pink toys are silly, limited and not very smart. 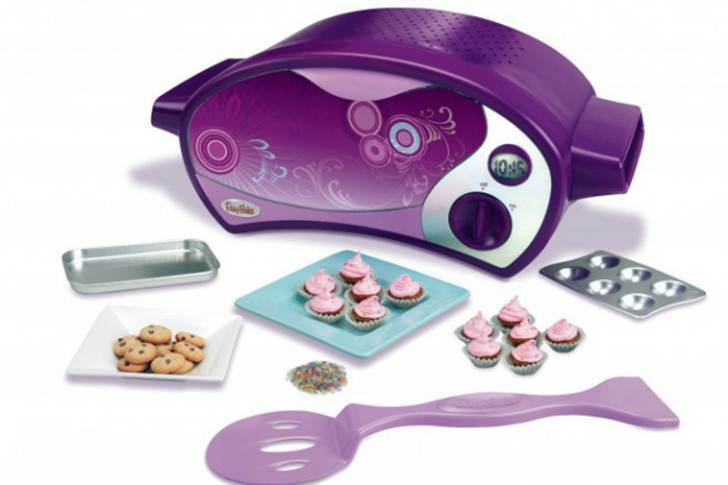 I remember wanting the Easy Bake Oven as a kid. Back then I believe the oven was a god-awful burnt orange and yellow color, so trust me, I wasn’t basing my choice on color. I just wanted to pretend to cook. Period. I’d guess that’s why most kids want an Easy Bake Oven. No matter if a toy oven is pink, black, blue or sparkly, the end result is the same – your child gets to pretend to cook and fun ensues. If you’re not happy with the idea of an Easy Bake Oven, go ahead and sign this petition. Make sure that all kids know that colors are indeed gender-specific. Tell your kids that pink and purple are girl colors and if they had any sense of self respect they’d shun those girly colors. By all means, let’s encourage toy companies to produce only black and white and beige toys (fun!). Or you could be sensible. Tell your child that any toy in any color is perfectly fine, so long as they enjoy it. Better yet, why not just skip the plastic, toxic (likely made in China) nightmare that is an Easy Bake Oven and get your child a quality eco-friendly toy kitchen. Or you know, let them cook with you in the real kitchen in your real beige oven. May I suggest the design colors just match what real kitchens use. Then the child feels they have stuff just like their parents. Just a thought. Keep it real. A 13 year-old New Jersey girl, McKenna Pope, recently started a Change.org petition in order to appeal to Hasbro that their popular Easy Bake Oven toy should be more gender-neutral. Pope started the campaign because her little brother really wanted an Easy Bake Oven for Christmas, but not the purple colored oven that Hasbro currently makes, as it's too girly. Pope's heart was truly in the right place when she started this petition. I applaud any youngster who takes the time to actually take a stand for what they believe in, but the consumer pandemonium that has ensued due to this campaign is a bit wacky and ironically�incredibly�sexist, which obviously defeats the purpose of an anti-sexist campaign.